Eyelashes can be a frustrating process. But its one of those things that the more you do, the easier it gets. But here are the steps I take, and any tips I have to make it easier. 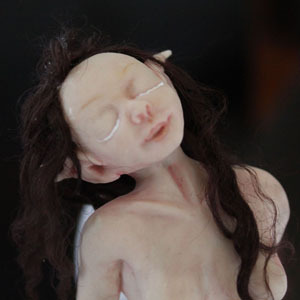 Here she is all ready for her eyelashes. 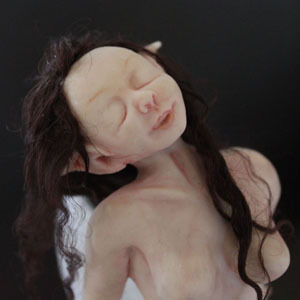 Start by adding a thin line of glue to her eyelids, the same process is done whether she has her eyes open or closed. The glue I am using is Crafter’s Pick Ultimate Glue. It is a nice strong tacky glue that has a great cement feature where you can glue two sides, let the dry clear, and then press them together. My tests have shown this to be much stronger than just gluing them together. While the glue on the eyelids is drying its time to get the feather ready. The feather I am using is an ostrich feather. Each strand has tiny little feathers that are great for eyelashes. Using very sharp scissors trim away one side of the feather. Leaving the center shaft and half the feathers. You will need two of these, but make sure you get one with feathers leaning to the left, and one with feathers leaning to the right. 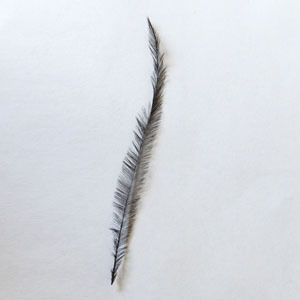 Apply a line of glue to the feather shaft. Use a toothpick to aid in the precision of your application. At this point you can either cut the feather to size, or leave the extra feather on to hold onto. Whichever you find easier is fine, I tend to use both methods depending on how easy it is to get to the eye (ie no hand or arm in the way). I have found the best combination is letting the glue on the eyelid dry completely clear, but let the glue on the eyelid only partly dry, this seems to give the best combination of tackiness of the glue and ease of application. Start with pressing the feather to the middle of the eyelid, with any excess towards the outside of the face. When the middle is holding, gently press the inside of the eyelash into the eye-duct. You can use the sharp point of an X-Acto blade to help with this. 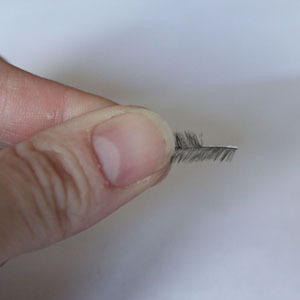 When you are happy with the inside cut off the excess feather and then press the outside of the eyelash into the glue. This is where having a good clay eyelid will help to press the eyelash under. Step 5 Repeat the process on the other eye. Again remember to use the right feather, so that the lashes are pointing in the right direction – away from the center of the face. 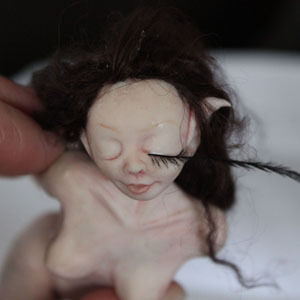 If your doll has her eyes open you can choose now whether you have lashes on the bottom as well. I tend to just paint some bottom lashes, but the choice is yours.